07/02/14 – Added Zzap 77 scan showing proof that US Gold were considering Sonic as a conversion. 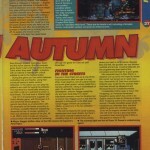 A huge hit on the Megadrive and other sega systems…. In the early 90’s, Sega signed a deal with US-Gold to allow them to convert their titles to other computer systems… such as E-Swat and Alien Storm. Sonic was actually amoungst the planned games for the C64 and other platforms, and US-Gold were eagerly awaiting Sega’s permission to start work on converting it over. 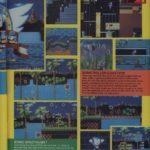 Issue 77 of Zzap 64 in particular had a small article about upcoming games, which included Sonic. US-Gold waited and waited, but Sega decided that their blue hedgehog creature was far too popular and made people buy their Megadrive’s, so they kept him on their platform only…. and only years later Sonic moved onto other platforms. If anything was actually started, its unknown, quite possibly someone did some test demo’s to see if the C64 was capable before Sega gave the thumbs up, but its unlikely. Some Amiga mockups were produced, but it is unknown whether these were faked in Deluxe Paint. But GTW will try and find out exactly what happened with Sonic on the C64 in anycase. ‘George:I think you could have ported something like Sonic to the Amiga. So, If Amiga version would of been more akin to MS version, i wonder just how much of Sonic would of been retained for any possible C64 version?not much i’d wager. Cheers Ross – I doubt very much it would have been any good had anything been started. These days, i’d like to see an attempt to do something like the Master System version – especially after seeing games like Sam’s Journey. Plus the Master System version of Sonic is really underrated, and one of the better Sonic games, so another port would be cool! On base it makes sense that Amiga and ST Sonic would follow the Megadrive one – in theory source code could've been virtually 1:1 since they both used Motorolas clocked at similar speeds. But then loading massive areas from floppy and storing them in RAM like vs. streaming data from cart and suddenly George Allen's dream of an Amiga Sonic engine that could actually run the game just vapours away. People miss that a lot of the time – yes, you could build a Sonic engine for the Amiga that would run almost as slick but it ain't gonna resemble the original thing once all that other guff is loaded into memory. And then you look at what the C64 could've done. Turrican's eight way scrolling is great, but not smooth or quick enough for the multilayered maps of Sonic – and yes, Mayhem has the huge speed and great scrolling but it lacks the intracacies and dynamics of Sonic's level design. There must be an Amiga proto out there. I'm convinced of that. US Gold rammed these things out so quickly and they already had the wider "arcade hits" deal signed and sealed with Sega – why would they have expected Sega to put the foot down and say no? Part of me thinks that US Gold may have shown an early proto to Sega and they laughed with a "no way man" before spinning off down Ropponghi Hills back to Sega HQ.